As long as I can ever remember most salmon anglers work fairly hard for a take on the fly on the vast majority of Scottish salmon beats so it's crucial you make all hooking opportunities count. Just because a salmon pulls on your fly doesn't mean it wants you to quickly return the compliment! Don't let the excitement of being out on the salmon river and the instant 'wake up' realisation that finally a fish has taken your fly make you do anything silly. In most cases when a salmon takes the fly the fish has come off its lie to do so and possibly even followed the fly several feet or more before it decided to 'snaffle' it. With that in mind logic will confirm that the salmon (if allowed to do so) will take and turn on the fly and head back to its original holding position as long as you don't react to the initial contact! 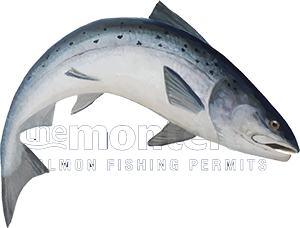 To hook salmon successfully its all about applying 'effective' hook pressure and the right time during the take. The problem is that any contact from a salmon can easily catch you off guard and falsely accelerate time even for the most 'steely headed' and composed salmon fishers. Contact from the underworld is a 'highly potent' sensation that is probably the most unexpected & unmanageable feeling in the world and the correct non 'reactive' response is the opposite of what anyone's brain will be urging them to do! It's imperative that you 'keep the heid' when contact is felt and you don't morph into one of these panic stricken 'rod lifters' who'll convince themselves that the inevitable slack line that followed the series of tugs they 'just lifted' into was only a trout! Trout rarely nip a salmon fly more than once nor do they often like to take a salmon fly so any knocks on your fly should always be treated with cautionary suspicion! It's important that you visualise what's going on under the waterline when that initial pluck is felt as the salmon takes the fly so you get to grips with proceedings sooner. Whether or not you've receiving one initial tug or a series of them it is crucial that you 'wait' for the nice steady draw of fly line off your lightly set reel drag to begin. That's the indicator your looking for so completely ignore the initial stages of contact until you're convinced the fish has turned on your fly and is heading back to its original holding position. Now you've got the perfect situation to demonstrate to the salmon who the real owner of the fly is! If you've had the composure not to react to the initial contact and you're now witnessing a steady & consistent draw of fly line from your reel with the rod pointing down in the general direction of the fish then simply put the brakes on it! For me I'm always looking for a good slow 5 to 7 seconds of steady line draw before applying the hook point pressure. The most logical way to do this is by simply squeezing the reel face firmly and let the line lock up tight via the forward momentum of the salmon. If you do this at the correctly timed moment and feel the weight of the salmon for 2 or 3 seconds (before lifting the rod) then you don't need to be Albert Einstein to work out whether or not you've applied sufficient hook point pressure for an effective hook set!